Advertisement for Maxine’s 1977 lecture from the Queens College student newspaper. 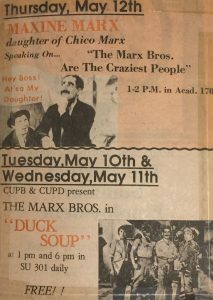 Like many other Marx Brothers fans, I first got to know Maxine Marx shortly after her book, Growing Up with Chico, was published. I had seen her deliver a lecture at Queens College in 1977, but my long friendship with her would begin later. My old pal Charlie Kochman took the initiative and called Maxine’s office at Cunningham & Walsh, an advertising agency where she was employed for many years casting television commercials. Charlie made an appointment and went to see her, his copy of Growing Up with Chico in hand. He was given some papers to fill out and finally got to see Maxine, who promptly asked if he had a headshot and a resume. She assumed he was there to audition for a commercial. She yelled at him for wasting her time, but happily signed his book. When the three of us met for lunch a short time later, I picked on Charlie a little for wasting a busy casting agent’s time. Maxine loved it. 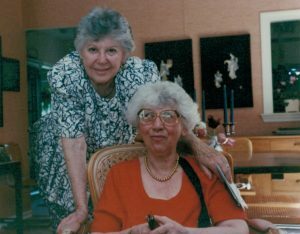 Toby and Maxine during a Bryn Mawr visit in 1992. On the way back to New York I told Maxine I would drive her to Bryn Mawr any time. We made a few more trips, but the last one was tough. When Toby passed away suddenly in 1994, I drove Maxine to the memorial service. Toby and Maxine had been close friends since the night they shared a seat at the Broadway opening of Animal Crackers in 1928. She hadn’t thought much about what she would say of her friend of 66 years. She delivered a touching tribute without betraying much emotion. She kept it light and funny. Then she wept all the way home in the car. She discussed her own mortality and expressed interest in an organization called the Hemlock Society, which was basically an advocacy group for assisted suicide. Maxine was determined to never become horribly ill. I changed the subject as many times as I could, but the discussion only ended when I dropped her off at her apartment. Maxine had a bad leg and had been hobbling around with a cane from the time when I first met her. Eventually the cane gave way to a walker, and finally a wheelchair was necessary. But otherwise she was in pretty good shape. Mentally she remained sharp as a tack and had a great memory. I was her wheelchair driver when we occasionally went to the theater. I remember seeing a wonderful Broadway show with Maxine called Fool Moon, starring Bill Irwin and David Shiner. After the show she insisted on introducing me to Irwin, a friend of hers for years. I pushed the wheelchair to the stage door where, naturally there was a cluster of autograph- seekers. Maxine shouted, “Out of the way. Old lady in a wheelchair coming through!” I was a little embarrassed when they cleared a path for her. But it was nice to meet Bill. 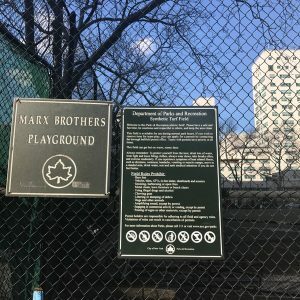 Occasionally my wheelchair driving duties intersected with my minor role as a so-called “Marx Brothers scholar.” When the New York City Department of Parks & Recreation decided to honor the Marx Brothers by naming a playground in their boyhood neighborhood after them, Maxine and I were both invited to participate in a special event at the Arsenal Gallery in Central Park. The festivities took place on November 21, 2003, so it was also a 70th anniversary screening of Duck Soup. 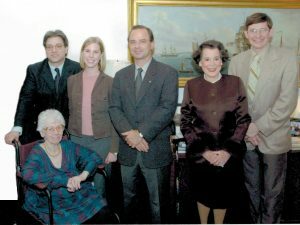 Since Kitty Carlisle Hart was there, A Night at the Opera was also screened. There are several copies of my book Groucho Marx and Other Short Stories and Tall Tales signed not only by me, but also by Maxine and Kitty floating around somewhere. My sales increased that night because these lovely ladies didn’t bring anything of their own to sign! 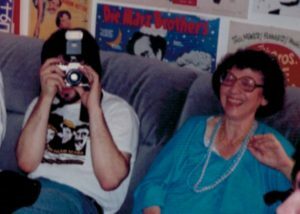 Robert S. Bader and Maxine during a 1988 visit to Paul Wesolowski’s house full of Marx Brothers stuff. 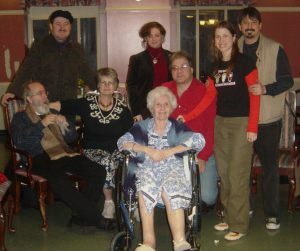 Celebrating Maxine’s 90th birthday, January 13, 2008. When Maxine passed away in 2009 I was not surprised. She had been having a rough time for a few months and it made me think of her lectures about the Hemlock Society. Her sons, Kevin and Brian, contacted me and told me that Maxine requested I be one of the speakers at her memorial. I was honored and pleased to do so. Of course I immediately thought of Maxine’s speech at Toby’s memorial. All of the speakers knew they had to be funny. No tears for Maxine. I flew to New York and also agreed to read a letter from Maxine’s beloved cousin Bill Marx, who was unable to make the trip. I made a critical mistake when I read Bill’s letter before I made my own little speech. I had glanced at the letter on the plane but had done so without realizing how incredibly funny it was. As I read Bill’s letter at the service the audience howled with laughter while I dreaded having to follow this hilarity. All I could think of saying was, “I’ve got nothing.” But I got out of trouble by telling about an idiotic adventure I shared with Maxine one Sunday afternoon in the mid-1990s. She needed a new area rug and we drove from her Central Park West apartment to lower Manhattan, where we selected a rug and strapped it to the roof of my car. As we headed uptown the rains came. And so did the traffic. As we sat there on the West Side Highway, I saw the soggy, drooping rug starting to cover the windshield. By the time we got to her apartment I was sure the rug was ruined. But with the help of a strong doorman I was able to lift the sopping wet thing and get it into the building. A couple of sunny days on the roof ultimately saved the rug. Maxine loved telling the rug story. Over the years the rug became bigger and wetter. 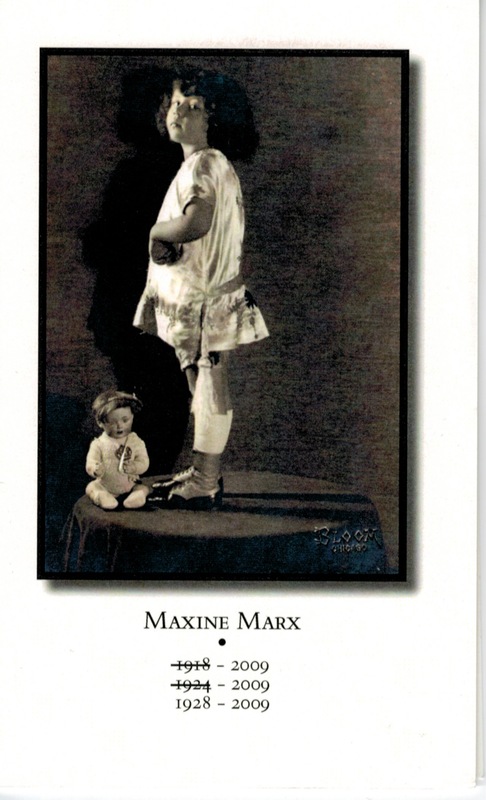 When I started working on Four of the Three Musketeers: The Marx Brothers on Stage, Maxine was my first primary source. I didn’t even realize it at first. All those years of talking to her about her life and the Marx Brothers had given me valuable insight into things I would never otherwise have had. For example, she knew Minnie Marx. To me she was the legendary stage mother and the dynamo that made the Marx Brothers into stars. To Maxine this amazing lady was her grandmother. Maxine was a few months shy of her twelfth birthday when Minnie died. She remembered her quite well. She also had a lot of stories about her grandfather. She described Frenchy as “adorable.” She once told me that Harpo had inherited the best qualities of each of them. Near the end of her life I would give her updates on Four of the Three Musketeers. I was never quite sure when it would be finished and she would tease me about it coming out after she was dead. As usual, she was correct. The book was published seven years after Maxine left us. But that doesn’t diminish her immense contribution to it. I treasure the memories of sharing some of my research with her and getting some very big laughs out of her as a result. It was the least I could do. She certainly provided me with a lot of laughs over the years.